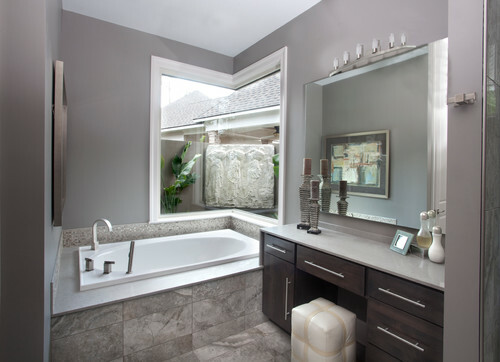 “Spa bathrooms and Zen-like retreats are definitely desired aspects of today’s bathrooms, driving a more contemporary aesthetic,” says John Petrie, the 2014 NKBA president. 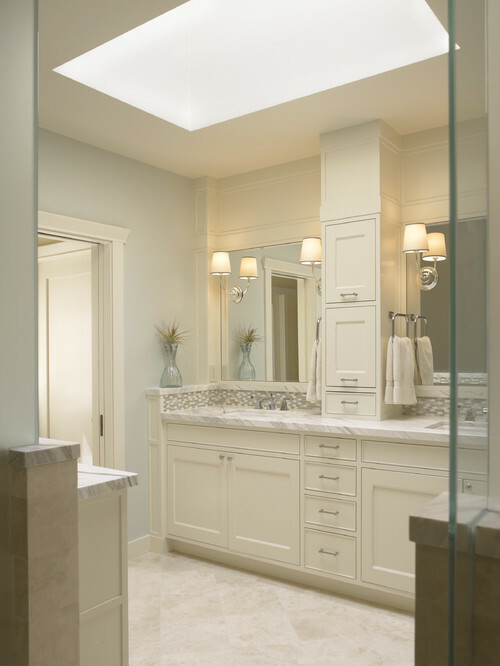 Simple styles, with an emphasis on clean lines and functionality, are in high demand, adds designer Maria Stapperfenne of Tewksbury Kitchen & Bath in Whitehouse Station, N.J.
Below are among some of the trends designers identified for bathrooms this year. Sixty percent of designers say they anticipate doing more universal design/accessible bathrooms this year. For example, about half of designers specified the growing popularity of no-threshold showers. 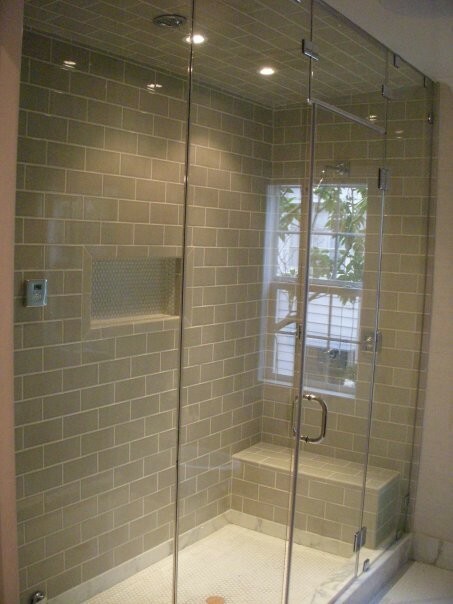 These showers allow home owners to more easily walk or roll into the shower without having to step over any small ledge. Spotlights are being turned on in the shower. 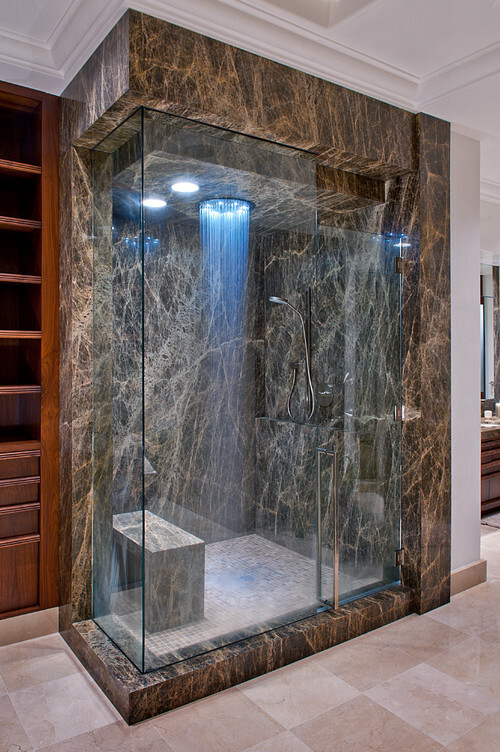 More designers say they are incorporating lighting in showers. Designers also say they expect more benches and seats to be included in showers. Steam showers are growing in popularity –with twice as many designers specifying steam showers being incorporated than whirlpools in master bathrooms. Toilets and vanities are getting more of a lift. Eighty-four percent of designers said that comfort height toilets and vanities gained popularity in 2013 and are expected to continue to be a growing option this year. 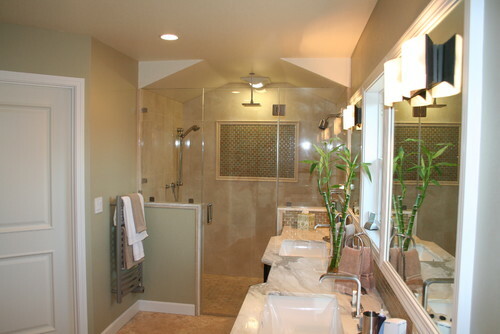 Similar to kitchen designs, designers noted a decrease in Provincial and Tuscan-style bathrooms, as well as a decline in rustic/country styles. Also, black was the least popular fixture color and is expected to decline even more this year, NKBA designers noted. That bathroom by Oklahoma City Tile with the shower lighting… just wow. Perfection! Melissa, simply breathtaking. 58 percent approve of grey in 2014, interesting. I agree with Adam, if you throw me into a home with the Oklahoma City Tile shower, I’m a buyer. Wow, I wish we had a few homes in Florida with this work-of-art. Simply amazing! Thanks for sharing!